When Punit Malhotra debuted with his extremely hilarious take on desi romance in movies with I Hate Luv Storys, this writer was initially apprehensive. However, on viewing the film, he found it a fresh, albeit heavily predictable take on romantic comedies. 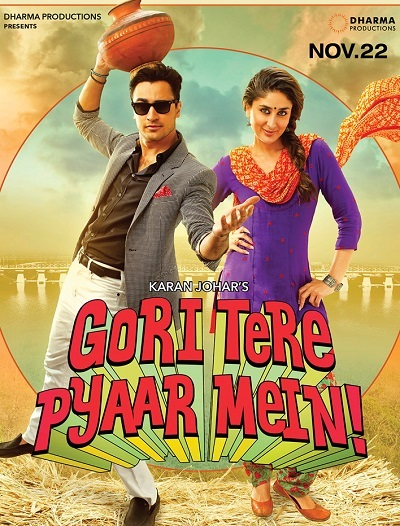 It was thus natural for expectations to be grounded enough for the movie that came to be known as Gori Tere Pyaar Mein! later in the industry circles. And insofar, things have been quite focused, right from the balanced promotion all through it’s heartwarming trailer and bang-on music album. Specifically too, it repeats the critically successful pairing of Imran Khan and Kareena Kapoor Khan from Dharma’s previous Ek Main Aur Ekk Tu, thus generating buzz enough for the movie. As unfortunate as it may be though, the adage “all that glitters is not gold,” seems to ring quite true in the case of this film (or probably any other film that starts off with a song in the first two minutes of it’s first act). So we have this care-a-damn guy Sriram (Imran Khan), who loves to love himself. He falls in love with headstrong-but-crazy social activist Dia (Kareena Kapoor Khan) and begins a relationship with her. They break up due to a clash of ideologies. Sriram, as it turns out, can’t seem to forget her even as he narrates his story to the girl he’s getting hitched to, Vasudha (Shraddha Kapoor). It is, after all, a Hindi movie, and Sriram thus makes a dramatic run from the marriage ceremony to follow his heart, only to realise that she’s now in a village in Gujarat. Thus starts a Swades of a more predictable kind. Let the writer of this article be honest; predictable movies of such a genre are welcomed with a breath of fresh air. They’re light, fluffy, and there’s some sort of satisfaction things are going to wrap up just fine by their culmination. One of the major differences, however, between Malhotra’s previous and current film is the screenplay. While I Hate Luv Storys also stood on schmaltzy, manipulative and predictable ground, it’s foundations were strengthened by the very smart narrative that completely turned the feel of the film around. To add to that, Khan and Sonam Kapoor shared an electrifyingly fresh chemistry to boot. Here, both the narrative and chemistry suffer, making the film more of a moderately enjoyable dramedy you’d probably not go back to. Imran and Kareena’s rapport in Ek Main Aur Ekk Tu turned out to be a masterstroke of sorts. Their pairing here, however, is half-baked to a large extent; sometimes awkward even. The blame here should go to a clear case of misdirection with regards to their chemistry and character evolution. Worse? The pre-intermission and post-intermission portions look like two different movies. This is a sore notion of a very rocky screenplay overall. Technically, the film is backed by brilliant cinematography and quite a good edit which unfortunately turns gimmicky during the visuals of songs. Production design is quite impressive in many portions, with a strong sense of art direction in the creation of the Jhumli village. The styling of the characters, however, really end up clashing with their surroundings; Kareena Kapoor, in particular. For a social activist, she seemed a bit too glamorous throughout her time in the village to look real. The music is a masterstroke, with chartbusters like Dhat Teri Ki, Tooh and Naina getting their due on screen. One shining aspect of the music is that apart from the abrupt entry of Dhat Teri Ki, the rest of the songs seem to blend in well into the film. Performance-wise, Imran Khan gives everyone a sense of deja vu. An important aspect of his monotony in each film would probably be the lack of success he achieves in trying anything away from his image. Kareena Kapoor holds onto her own as the feisty social worker, howsoever unbelievable her character ends up getting through the end. Nizhalgal Ravi and Sujata Kumar are endearing as the stereotypical Tamil parents of Sriram. Shraddha Kapoor does quite a fine job as Vasudha through her screen time. In fact, she ends up surprisingly being the most believable character through the film. Anupam Kher hams the life out of himself, but doesn’t go anywhere. Vineet Kumar Singh is no great shakes, especially considering his previous repertoire of performances in films like Gangs of Wasseypur and Bombay Talkies. Neelu Kohli is endearing as Dia’s mom. Esha Gupta looks stunning in her screen-time but contributes to nothing in the film. Others are efficient enough. Gori Tere Pyaar Mein, can unfortunately never replicate the goofball charm of I Hate Luv Storys or even the kind of chemistry the leads shared in Ek Main Aur Ekk Tu. Sure, there are lots of genuinely funny and heartwarming moments spicing the film, but sketches do not a movie make. Let's just say the first half is a weird, twisted version of Namastey London and the second is a weirder version of Swades, and either semi-movie doesn't work to it's entirety. Sections of viewers, however, have chances of taking a liking to this film. For the more specific kind though, like this writer, something this generic will not hold too many chances of clicking.